Here at Daybreak Oxford, we operate three dementia day clubs for people who are living with dementia in the Oxford and Kidlington. Daybreak day clubs are the only day facilities in Oxfordshire that offers daily cognitive stimulation therapy for our members. As well as an enjoyable experience among friends for our members, we also offer a well-deserved break for family members from their care-giving responsibilities and carer support groups to those who may need additional, practical support. We are looking for motivated volunteers to help us ensure our members have the best experience possible at the day clubs. Perhaps you are a student or business person looking to enhance your CV; a stay-at-home parent or retiree looking for ways to spend your free time or maybe you are just looking for a new challenge to undertake. Whoever you are and whatever your lifestyle, volunteering doesn’t need to be daunting; we understand people live busy lives and your time is precious. So here are four ways you could volunteer for Daybreak and we guarantee there will be an option for every schedule and personality. 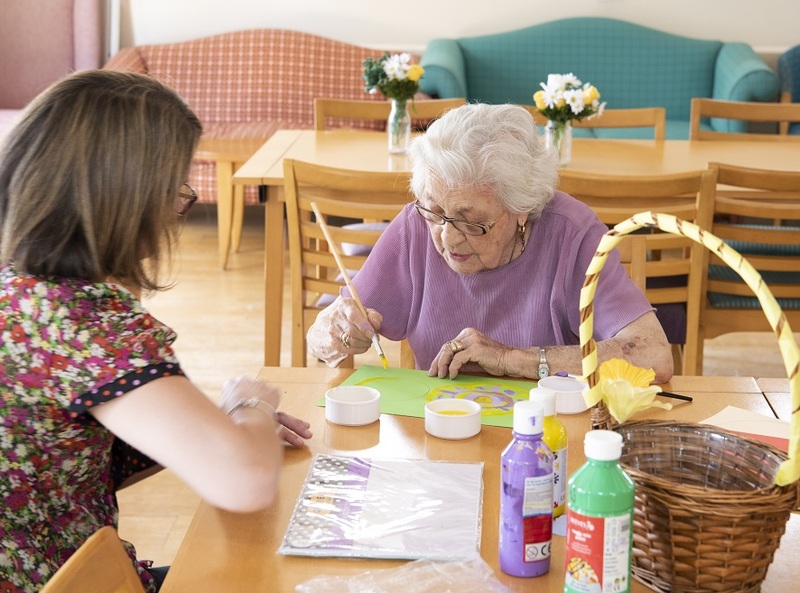 Offering our members cognitive stimulation therapy is incredibly important to us, it is proven to improve memory and thinking skills as well as improving the quality of life of those living with dementia, by stimulating memories of joy associated with sound and movement*. You could attend one of our day clubs and help us to ensure cognitive stimulation therapy is as effective as possible. Volunteering at the day clubs does not just mean serving tea and coffee, having you there to chat to our members will enhance their day, helping to reduce feelings of isolation and loneliness. Perhaps you have a musical talent, a hobby or interest that our members could enjoy partaking in or be entertained by. Whatever the skill we’d like to hear from you. If you are a friendly and reliable person who has an interest in helping people living with dementia, then this could be for you. Working alongside our trained staff, your interests, experience and general skills could make a valuable contribution to the day clubs and the gratification of our members. Please note, you must be 18 or over to volunteer in this capacity, but there is no upper age limit. There is flexibility in this position too – you can attend the clubs as often as you like and stay for as long as you please; all that we ask, is that you are a dependable and welcoming person. Do you have a head for business, finance and IT? Maybe you have experience as a carer or within marketing and PR. If the answer is yes, then perhaps you are looking for ways to benefit the community with those skills. You may be interested in being involved with how Daybreak is run. Becoming a member of our board of trustees may be for you. Being a trustee is the perfect volunteer role for someone who leads a busy life as there are only four meetings a year. You will get to work with new and interesting people who have similar interests to you’ with the bonus that your portfolio and your social responsibility activities will be enhanced by the experience. If you are looking for a bit more responsibility, there is also the opportunity to take an officer position; these positions are Chair, Treasurer and Secretary and you will be able to run for these positions on specific dates in the year. If you are a committed individual who is happy to take some level of responsibility, then we would like to hear from you. Administration is a busy and sometimes difficult task to get done when there are time constraints; especially when running a charity with a demanding schedule. Therefore, we need help from dedicated volunteers who have a head for administration. Perhaps you’d like to volunteer but aren’t available during the day or prefer to work alone. You could be a volunteer administrator, where some of the work could be done from your home. We need help with database design, office systems and other computer-based admin; IT skills are particularly valuable in this respect. If that sounds like something that might interest you, please get in touch with us. There are so many ways you can fundraise for Daybreak. We often have events planned that you could volunteer at or join in with. Contact us for more info on our latest planned events and how you can get involved. Perhaps you’d like to set up your own event or want to take on a sponsored challenge – we can help you with this too by providing you with a fundraising kit and offering any advice and support you may need. Recently, generous volunteers raised funds for our Dementia Day Clubs by completing the likes of a sponsored swim, a half-marathon and even an attempt to climb Mount Kilimanjaro. So, if you’d like to undergo your own fundraising challenge, whether it’s big or small, a cake sale or a skydive, please contact us for your free fundraising kit and to ensure we can provide you with that extra lift. We’d also love to hear what your plans are for our social media sites and blogs! If you want to help, but you’re not the type to climb a mountain, there is also the option of becoming a ‘Friend of Daybreak’ by donating £25 a year or a smaller amount per month. For more details, just ask. We appreciate the time you’ve taken to give some thought to your volunteering options. If you’d like to hear more or have any questions, please feel encouraged to contact us for a no obligation chat.